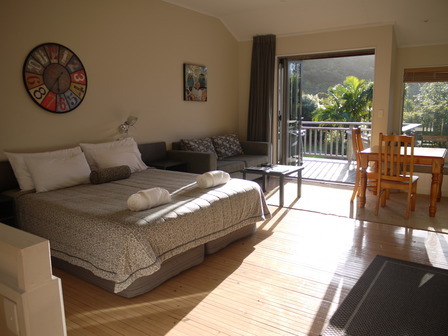 Bay of Islands Holiday Apartments and Campervan Park is located in the New Zealand paradise that is the Bay of Islands, we offer luxury apartments and campervan facilities at reasonable prices. Set in two acres of a mature olive grove, we have 18 powered and 10 unpowered campervan sites, as well as five apartments, all within walking distance of the beach. 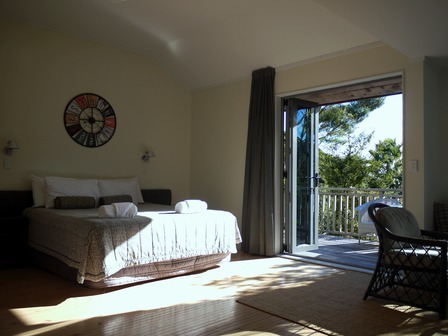 Our five self-contained apartments in the heart of the Bay of Islands, cater to guests who like to relax in comfort, style and privacy – fuss free. Choose from a stylish Studio for two, the spacious 3 bedroom apartment or the our lovely Family Studio apartment that sleeps up to five. Close to all local attractions yet in a really tucked away, tranquil spot, Bay of Islands Apartments are a home from home, somewhere to relax and unwind with family and friends. With super king large double bed that can also be split into 2 king single beds. Easy studio living with modern features, set on a low hillside in peaceful native bush. Our one bedroom studio apartments are suited for couples or 2 friends, but also large enough to cater for a young family by adding a rollaway bed or cot. Each apartment has a fully fitted kitchen fully supplied with everything you need. The upper outdoor decks are an indoor outdoor spaces reached via trifold doors with new (Sept 13) Barbeque’s. Towels and linen are supplied. The Apartments are not serviced, we will remove rubbish and recycling daily, and towels and linen are changed after each 3 night stay. Apartment sleeps up to 2. Large Studio living area with a super king Double Bed, and one bedroom downstairs that has 3 single beds. Our Family Apartments are great for couples on their own, a family of up to 3 children, or a group of friends. Each apartment has a fully fitted kitchen fully supplied with everything you need. The upper outdoor decks are an indoor outdoor spaces reached via tri-fold doors with new (Sept 13) Barbeque’s. Towels and linen are supplied. The bottom bedroom opens onto large flat private lawn area which the kids love to play on. The Apartments are not serviced, we will remove rubbish and recycling daily, and towels and linen are changed after each 3 night stay. (Twin Room). The central living area has a kitchen, table, chairs and sofa. There is a 42” Flat Screen TV with Sky Premium TV. The new kitchen was fitted in November 2013, with a Breakfast Bar. It has a 4 ring induction hob with extraction, convection grill microwave oven, and full size fridge. The outdoor patio is reached via a large ranch slider to a picnic bench style table, and has a new 4 burner Barbeque. Whats more all this is wheelchair accessible with a low ramp access, a wetroom shower and 2nd toilet accessed immediately adjacent via a covered walkway. We have a beautiful, natural, friendly and relaxed Campervan and Caravan park amongst 2 acres of a mature olive grove. 18 powered and 10 unpowered sites. Showers have unlimited hot water on a $2 coin 5 minute cycle. Covered BBQ area with free gas BBQ’s, next to a large lily pond. There are dumpsites and fresh water access throughout the site. Laundry over quickly with our commercial washer and dryer for $4 cycle. Well behaved dogs are welcome, owners are required to be responsible for them. A small number of tent sites amongst the orchard, which is on sloping ground. In a beautiful tucked away spot on North Island, New Zealand is Bay of Islands.The small townships of the Bay of Islands are steeped in colonial history, and set against a patchwork of gently rolling farmland and ancient forests of venerable kauri trees. The 144 islands are scattered in the clear Pacific waters, which are abundant with marine wildlife. Paihia is Tthe centre of all water-based activities in the Bay of Islands. The town is surrounded by three pretty bays and sheltered from the ocean by the Russell Peninsula.